Proper equipment maintenance starts with a solid filter replacement schedule. Failing to change filters in a timely fashion leads to over-saturation and unsafe working conditions. Even small levels of hazardous materials that escape old, expended filters pose significant risk. Order a full range of quality carbon filter replacements for Air Science® and all major brands of ductless fume hoods through Filtco Filters. Filtco Filters provides carbon replacement filters that are optimized for the absorption of a variety of hazardous materials. All Filtco filters meet or exceed OEM performance requirements. Reordering your filters has never been easier. 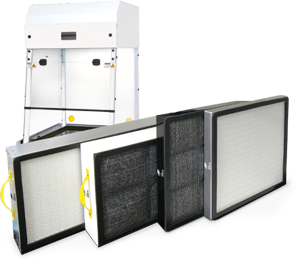 Shop by manufacturer, choose the exact filter you need, or contact Filtco to create a custom ductless filter for your equipment and laboratory needs. Registered users can reorder easily and choose to receive filter reminders so they never risk missing a scheduled replacement.